Sunday March 11th 1894 Josie went into church to be gone all day. I was busy about the house all forenoon. Will fixed some more shelves in the store room and I regulated that. Ott & Fanny were out in the afternoon and we had a nice visit with them. I read in the evening. 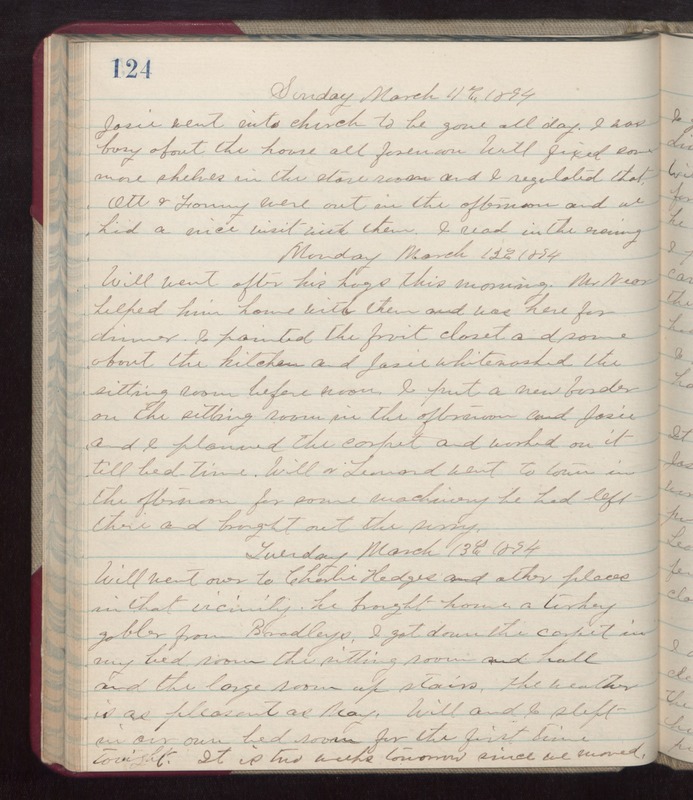 Monday March 12th 1894 Will went after his hogs this morning. Mr Near helped him home with them and we here for dinner. I painted the fruit closet and some about the kitchen and Josie whitewashed the sitting room before noon. I put a new border on the sitting room in the afternoon and Josie and I planned the carpet and worked on it till bed-time. Will & Leonard went to town in the afternoon for some machinery he had left there and brought out the surry. Tuesday March 13th 1894 Will went over to Charlie Hedges and other places in that vicinity. He brought home a turkey gobler from Bradleys. I got down the carpet in my bed room the sitting room and hall and the large room up stairs. The weather is an pleasant as May. Will and I slept in out own bedroom for the first time tonight. It is two weeks tomorrow since we moved.